You are here: Home / For The Love of Horses / The 2018 Standardbred Makeover hosted by Horse Lovers United, Inc. The 2018 Standardbred Makeover hosted by Horse Lovers United, Inc.
It’s a beautiful Saturday afternoon as I pull into the driveway of Pairadice Equestian in Milford, Delaware. I’m walking towards the barn and arena as I see 2 Standardbreds warming up in the ring and a line of trailers across the parking lot. I don’t see anyone I know just yet, but I recognize the dark colored beauty in the ring strutting his stuff. His rider draws him to a halt to direct a few helpers behind me. I’m still standing by the fence line when I lock eyes with the horse in the ring. I hear him nicker to me and I start to tear up. It’s my beautiful Beni boy and he remembered exactly who I am. For 2 years, he was my 1st horse. Due to uncontrollable circumstances I had to send him to Camille Kierstead, owner and founder of Pairadice Equestrian. Today is the 2018 Standardbred Makeover. 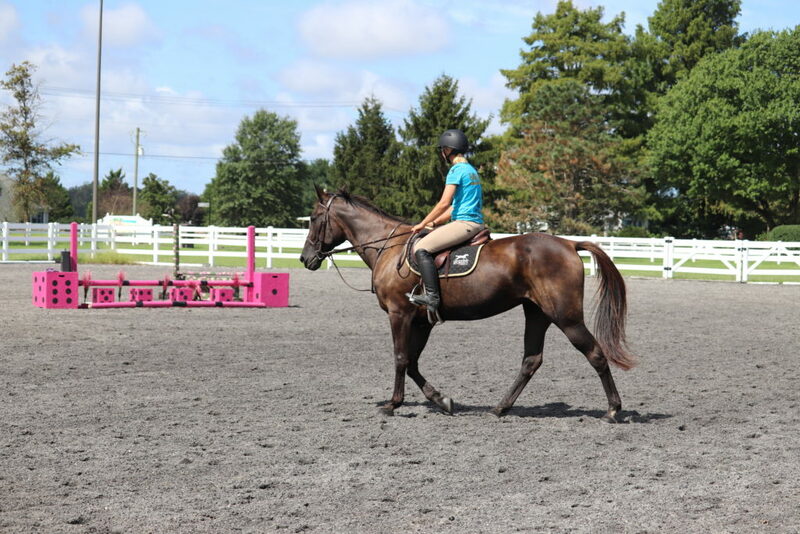 Standardbreds, recently retired from racing, are picked up by trainers and given the opportunity to get into the ring to help promote the versatility of the breed. Each horse is given 30 minutes in the ring to show how well they have progressed from a racing career. All the horses that compete in the Makeover are available for adoption. Each horse has so much potential and it shows in the ring. As each horse entered the ring, the crowd cheered and each horse instantly perked up. Brielle Roman had 2 horses with her, but 1st up was Korra. Korra is a mare that hates the ring and loves to be on the trails. Before the event, she was adopted by a family in Virginia who plan to use her for a trail horse. Korra impressed everyone with her grace in the show ring. Since she isn’t a fan of being in a ring, Brielle just put her through her paces. Korra looked great and held herself together through the whole show before getting to relax. Jumping on her next horse, Weapons Dealer, Camille headed into the arena to put on a great exhibition of western pleasure and tricks. She fired a cap gun off his back, swung a hulahoop around and rode him over a bridge. Dealer got put through his paces and wow’ed the crowd with his willingness to do as he was asked. AllAboutBeni, a 5 year old gelding, bounded into the ring like he had springs in his legs. 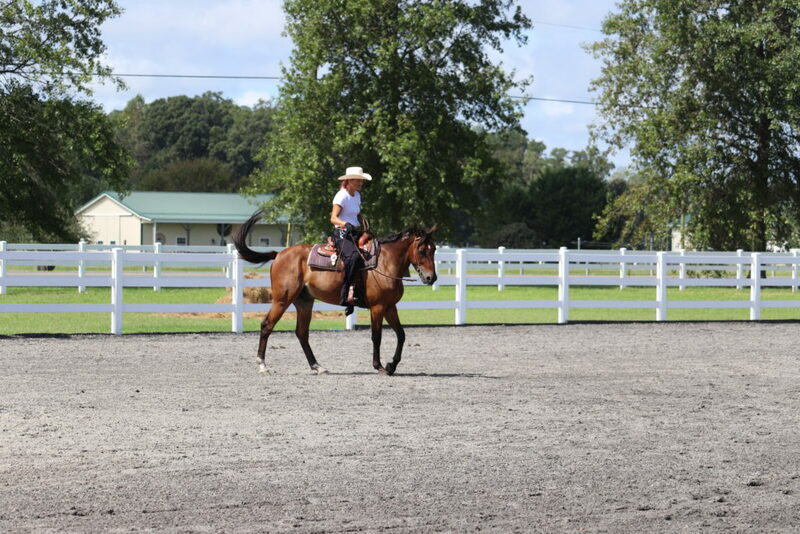 Camille and Beni broke into a beautiful dressage routine, accompanied by Lindsay Sterling’s Arena. After their performance came to a close, Camille quickly dismounted and handed Beni off for a tack change while switching out her own gear to get ready for her next performance. We were over half way through the exhibitions and next was AllAboutBeni’s jumping routine. Camille sent her team out to the ring to adjust the jumps and headed into the ring to make her warmup lap. They are lining up for the 1st jump when Natural by Imagine Dragons starts to play and they launch over the jump as the beat drops and the chorus begins. Beni was instantly in his own zone, flying between the jumps and lining up each one like he was born to do it! He didn’t refuse any of the fences and once he completed one full round, the kids raised up all the jumps and they flew around the course again to a different song. The crowd erupted in applause and cheering. Beni had won the crowd over and was clearly the favorite. The crowd calmed and the next rider entered the ring on her mount, Manny Hax. 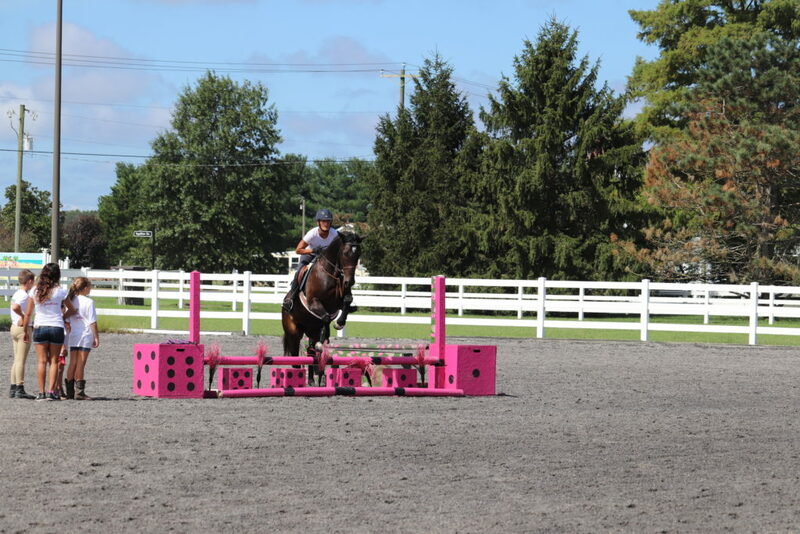 After a quick warmup lap and getting Manny comfortable in the ring, the dainty mare picked her way around the ring and over a few small jumps. Manny had a full racing career and never quite learned how to canter so she has a strange gait between a trot/pace and canter that looks awkward, but her trainer had the least amount of time to work with her. Camille wasn’t quite done yet. She set up both horses in the ring and put 3 mini trampolines out. One got placed between the horses, 1 on Beni’s left side and the 3rd on Dealer’s right side. Then Camille’s 2 oldest students held the horses in place while she bounced on the trampolines to jump up onto the horses’ backs and in between them. She kneeled on their backs and split between them. She did a full routine on both of them and it was amazing! All in all, the show was an amazing success! Weapons Dealer won Best Overall. Manny Hax won Best Canter. AllAboutBeni won Judge’s Favorite and Best Dressage Routine. 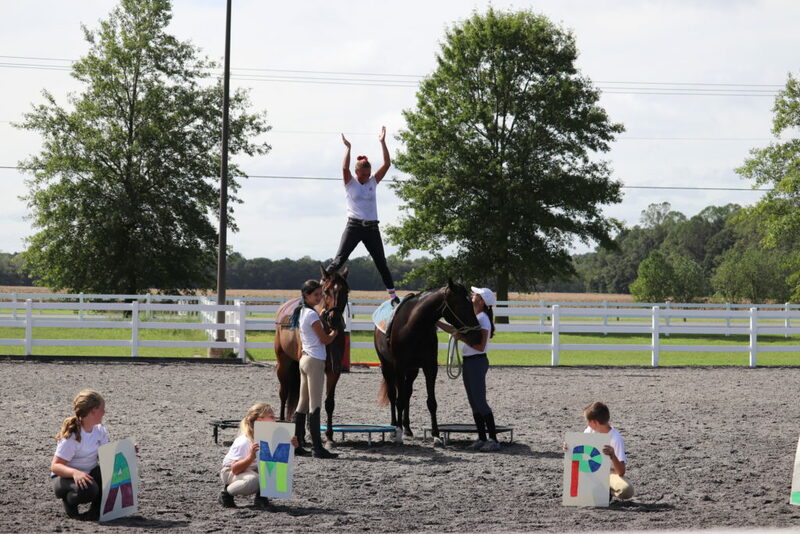 Once the awards were handed out, Brielle jumped on her personal horse, Shake Baby Shake, to do a jumping demonstration. Baby, as he is lovingly called, absolutely LOVES to jump and he flew around the course. Brielle had to hold him back to prevent him from pushing too hard or going too fast, but it was a beautiful sight. Live in the Milton, DE area and interested in taking lessons? Check out Pairadice Equestrian on Facebook! Brielle works for the Standardbred Retirement Foundation, rehabilitating Standardbreds from all walks of life and finding them their forever homes. You can see more about the SRF and Brielle’s work here. 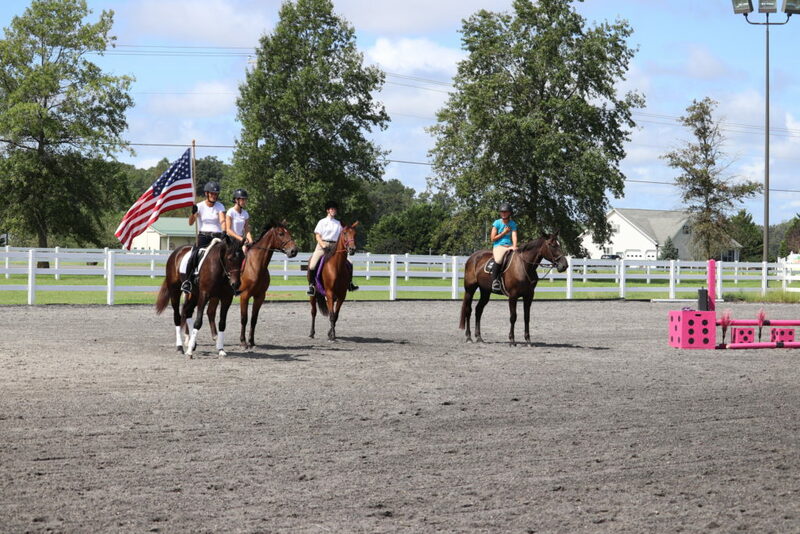 The Standardbred Makeover is organized and run by Horse Lovers United. You can read more about their organization and what they do here.